I am delighted to be here today in your midst at this historic venue. You have given me an extraordinary welcome. I am overwhelmed by the love and affection you have showered on me, and by this magnificent reception. Bangladesh is the first country that I am visiting as President of India. The last visit by an Indian President to Bangladesh was almost forty years ago by President V.V. Giri in 1974. For me personally, this is an emotional journey. I have my roots in the soil of Bengal, and have imbibed its language, traditions and culture. My wife was born in Narail and started her education here. I have grown up reading the compositions of the same poets as you, listening to the same songs which both our people love and walked along the banks of the same rivers which inspire the songs that make us all similarly wistful. When I was a child I never dreamt that one day I would come here as the President of my country. I was overwhelmed by the spontaneous outpouring of support and goodwill that I received from the people of Bangladesh when I became the President of India. I received many congratulatory messages from people from all walks of life and all parts of this country. I take this opportunity to express my deep gratitude to the people of Bangladesh for their good wishes on that day. Today, I stand on hallowed ground at this great University of Dhaka which will soon celebrate its centenary. It has been a century of accomplishment and on this occasion of its convocation ceremony, I felicitate all the students of this University who have successfully graduated in their respective academic disciplines. Dhaka University is the oldest and largest public University in Bangladesh. Today, as we recall its old reputation as the "Oxford of the East”, we note with pride its place among the top institutions of contemporary Asia. Students who graduate today are following in the footsteps of the great alumni who passed through these portals in the generations before you. The names of Bangabandhu Sheikh Mujibur Rahman, Tajuddin Ahmed, Satyendranath Bose, R.C. Majumdar, Humayun Ahmed, Buddhadeb Basu and Shamsur Rahman come to mind. They include many of the brightest minds of the last century – who distinguished themselves through their academic achievements. No one who comes here can forget how uniquely this University is identified with your nationhood. The halls of this great institution were the crucible and the ‘Karmabhoomi’ of the creation of Bangladesh. Numberless architects of the Liberation War sacrificed their lives in this campus. And before them there were the pioneers. Who can forget the day of February 21, 1952 when the students of Dhaka University defied the banning of public rallies by the then Government? The sacrifices made by the martyrs of the language movement have now been recognized by the United Nations, which has declared February 21 as the "International Mother Language Day”. It was again the students of Dhaka University who heroically resisted the brutal attack on the night of March 25, 1971 that killed more than three hundred of their colleagues, faculty members and intelligentsia. They along with many others had been a bulwark against the intolerance and hatred which had descended on this land – and who, in the years after Liberation, took forward the socio-political transformation of the country. It is this extraordinary spirit of humanity and confidence that has been instrumental in the advancement of Bangladesh by leaps and bounds. Bangladesh has emerged as one of the fastest growing economies in South Asia. This is laudable. I would compliment the government led by Prime Minister Sheikh Hasina and the people of Bangladesh for their achievements in all aspects of human development. In many social indicators, Bangladesh has acquitted itself in an exemplary manner. It is seen that the literacy rate amongst youth in Bangladesh - in the age bracket of 15 to 24 years – is now 77 percent while life expectancy at birth is now about 69 years. You have made good progress and set new benchmarks in the amelioration of poverty, eradication of hunger and universalization of education. The school text book programme of Bangladesh is known to be one of the largest in the world – and the gross enrollment ratio at the secondary school level is now about 51 percent. While the poverty ratio in Bangladesh is about 31 percent, you have world class achievements on which the edifice of a prosperous and developed Bangladesh will be built. I am sure that you, the youth of Bangladesh, will carry forward this great task with dedication. If, today, Bangladesh has embraced democracy, it is largely due to the values and principles which its people held dear when they fought for their independence in 1971. You have been steadfast. You, better than anyone else, know that democracy means the ability to respect differences and allow the will of the people to prevail for the common good. You know that it means respect for the rule of law and building of strong institutions along with free speech and a vibrant media. I am confident that democratic traditions in Bangladesh will grow stronger with time and that you will preserve democracy with your constant vigil. India and Bangladesh are interlinked like no other nations on earth. Our destinies are interwoven just like our history and our geography. Within our resources, India remains committed to supporting the comprehensive development of Bangladesh and the aspirations of its people. We believe that India and Bangladesh must develop and grow together, ensuring that our growth provides more opportunities to both our peoples. We both face common challenges and, as Her Excellency, Prime Minister, Sheikh Hasina has said, we have the same enemy – poverty. We need to work together to maximize the potential of our economic cooperation. Bangladesh is uniquely placed to exploit its natural and human resources to emerge as a fast growing, modern economy. Apart from the potential of its resources on land and sea, the geographical location of Bangladesh is an advantage that must be fully explored and exploited. Bangladesh lies at the cross-roads of South and South-East Asia. The idea of South Asian regional cooperation was born in Bangladesh. Bangladesh has once again taken the leadership in moving towards sub-regional cooperation. This will lead to practical results in terms of better water management, more electricity and grid connectivity, more trade and more cross-country movement of goods and people. India and Bangladesh can lead the way towards greater integration within our region and beyond in South East Asia. Bilateral relations between India and Bangladesh have received a major boost following the visit of Her Excellency Prime Minister Sheikh Hasina to India in January 2010 and our Prime Minister’s visit to Bangladesh in September 2011. We now have a "Framework Agreement on Cooperation for Development” that lays down the roadmap for our work together in the years to come. I am happy to note that both countries have made considerable progress in the implementation of the far-reaching decisions taken during these historic Visits. I assure you that India remains committed to implementing the decisions that have been taken. India and Bangladesh have vast opportunities to increase our bilateral trade and commerce. Government of India has taken the first step by removing quota and duty restrictions from all categories of imports from Bangladesh except twenty five tariff lines. Bangladesh now has duty-free access to our large market. I invite Bangladesh’s industry to make full use of this opportunity. We are working with the Government of Bangladesh to remove the remaining non-tariff barriers, open more border haats and harmonise our respective standards. The recently signed Revised Travel Arrangements between India and Bangladesh will lead to the liberalisation of visa arrangements between our countries. These will particularly help businessmen, students, journalists, tourists and those travelling for medical treatment. Greater people-to-people contacts and exchanges are the best way to bring our two countries even closer together. I am happy with the progress made in the implementation of the Line of Credit extended by my Government to the Government of Bangladesh. Several development projects, especially those pertaining to the railways sector, are now beginning to take off. I was happy to see double decker buses purchased under the Line of Credit plying on the roads. Many new Indian locomotives and wagons will soon be on the rail lines of Bangladesh. We have offered a grant of 200 million US Dollars to Bangladesh for utilization in projects of priority to Bangladesh. The first tranche - of 50 million US Dollars of this grant - was handed over a few weeks ago. Our countries have also made considerable progress in our co-operation in the power sector. The power grids of our countries will, for the first time in our post-independence history, be connected by the middle of this year. This will allow the flow of 500 MW of power from India to Bangladesh. The India-Bangladesh Friendship Power Company is setting up an ultra-modern super thermal 1320 MW power station at Rampal near Mongla to meet the energy needs of Bangladesh. My Government proposes to introduce a Constitutional Amendment Bill in Parliament to give effect to the provisions of the Land Boundary Agreement with Bangladesh and its 2011 Protocol. We are committed to working closely with Bangladesh to avoid any untoward incidents on our border. We can together make it a gateway of peace and mutually beneficial cooperation. The sharing of the waters of our common rivers is a high priority for us. We have successfully forged agreements in the past and are hopeful of arriving at an early accord on the sharing of the Teesta waters. Meanwhile, there are areas where we must substantially increase our cooperation, such as in information technology, skill development, agricultural research, environment protection, climate change, and in protecting the Sunderbans and harnessing energies, both traditional as well as new and renewable sources of energy. We must invest more in the field of education. There must be more exchanges of students, faculty, research scholars and academics between us. Government of India offers a large number of scholarships for students and professionals from Bangladesh. Many more students from Bangladesh are coming to India at their own cost to pursue higher studies. The Indian Council for Cultural Relations has established a Tagore Chair and a Hindi Chair at Dhaka University. These have contributed to greater academic exchanges between India and Bangladesh. I was delighted to meet a 100-strong youth delegation, the first ever from Bangladesh, last year. Many of the students were from the Dhaka University. I am happy to note that a similar delegation will again visit India this year. There are few countries in the world where music, poetry, art and drama are as deeply ingrained in a nation’s conscience as in Bangladesh. There is a lot that we, in India, can learn from you. I have the pleasure to announce that the Visva Bharati University at Santi Niketan will provide land within its campus to Bangladesh for the construction of ‘Bangladesh Bhaban’. This will serve as a focal point for research and documentation under the ‘Bangladesh Studies Programme’ of Visva Bharati. Looking at you, I am convinced that the future of Bangladesh is bright. I wish you all every success in making the dream of Sonar Bangla a reality. India will stand by your side as you shape the destiny of your country. 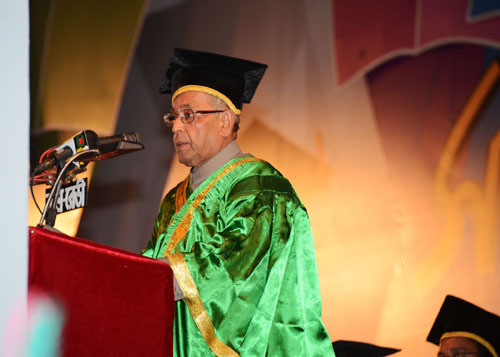 With these words, I accept, with utmost humility, the award of the Doctor of Laws Honoris Causa from Dhaka University. I once again thank the Dhaka University for inviting me to be among you all today. I take this opportunity of conveying, through you, the greetings of the people of India to the friendly people of Bangladesh.